The new design of website is almost accomplished! New backgrounds are fitting (and using) themes of the brand new album released! Twelve more days untill the new album to be available. Till then make sure to watch the new Meander video dedicated to the 50-years anniversary of the first space flight. Inspiration lyrics are to be found at the YouTube page. Completely new Meander video for the composition called Immersion from the album coming soon. Scenes were shot last year in Greece. Complete description can be found at YouTube page by following the link. According to things can be read between the lines he was quite contraversal person. Type O Negative music has granted me some of the finest moments in my life. Not definitely happiest, but unforgettable because of the mood Peter and the Band created. For me there was rough wine of green twilight, autumn sunlight and slight smell of burning leaves (and flowers) in the dark. An unthinkable mixture of sadness and relaxed happiness. So unthinkable and inimitable as irreplaceable is the loss. Thank You, Peter. Rest in deep green peace. And, to celebrate this date a little, I've finished the English version of the Underwater Skies—2008 (along with correcting the Russian). The album appeared to be a huge volume containing 400 images on 370 pages and around 80,000 characters of text. Mp3's of Meander and Inner Sea are waiting to be downloaded again, because recently they all have been updated and improved. The bitrate grew to 192Kb/s at average stereo (instead of 128Kb/s and joint-stereo at early works), the ID3 tags as well as file names were fixed to fit standart, so no problems with portable mp3 players from now on. Moreover, the Feedback form has been added for the easiest way to contact me. The Links section has been rearranged, and make sure to check website of Bernard Reeb, an amazing composer and musician from France to be found in "Music and Friends" part! Untill then, make sure to enjoy a renewed collection of desktop wallpapers (including ultimate edition of "A Song for the Sun" EP and some underwater pics) to be found in the Chest. Every piece grew to 1280x1024 instead of 1024x768 in size, and now they are arranged in groups as well. Claudia Ehrhardt from the Ice Vajal music website has published a review to "Beyond the Evening Spell", givving it 9 points of possible 10 (check it on website, or here, in the Chest. Thank You, Claudia. The configuration of my PC has been refixed recently, composing and recording will continue soon now. Not to mention, that I'm completely out of schedule with album, that ment to be to appear on the 14th of February already... Right now I've got some mighty audio card in my system (thanks again, Demon), so with a little professional consultation I'll be able (and brave enough) to rerecord any previous stuff, and a longplay will come then too. Wish me luck, I'm dumb at "powerbuttons". 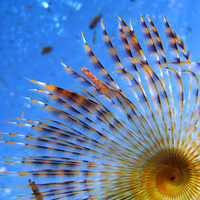 Celebrating the 5 year anniversary of building my first website, I present the Underwater photography gallery—2007, version 2.0., Remastered, supplemented, both in English and Russian. Over 50 species pictured, in more then hundred images, showing the underwater life and astonishing landscapes of the Aegaean Sea, accomplished with explicit text in around 40 000 characters. 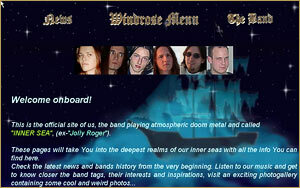 My first website, the Homepage of Inner Sea, hosted on a narod.ru was brought to life on the 23rd of December, 2002. That was day to day 5 years ago. It has been made using templates and online page-builder, and I have been so dissapointed by the result, that decided to learn the HTML. It took me next week to do that, and then, to the 1st of January an Inner Sea had it's own "design". b) it was worth nothing. I'm glad to wish you all Merry Christmas and Happy New Year one more time on a long way of our life. The English version of the Underwater gallery will be finished in a week or less. Exactly after a month of useless uploading attempts, "Beyond the Evening spell" single is available in the Music section of the menu. "BEYOND THE EVENING SPELL" single is out! 20 minutes of an Atmospheric Dark Light Metal featuring 17 minutes long title composition and a "postarmageddon" mix of the last, fourth, part of "Beyond the Evening Spell", the Abyss (collateral consequence of applying the invocation). The first copy is sent to the person, whom the single is dedicated to: Tom "Murphy" Kondor form Opus Altera. Downloading will be enabled as soon as I would find an ability to upload MP3 for your listening pleasure. I am finishing a composition to appear on a single, hopefully on the 29th of October. It's called "Beyond the Evening Spell" and the first version of it may be recalled by old Inner Sea fans. Now it's much longer, and, for now, is the longest composition of mine: exactly 17 minutes. Me and Szilvia are back from an awesome summer vacation. Definitely, it was Greece again:) Soon the first gallery of the underwater photography will be uploaded, as soon as I'll finish selecting the pictures, adjusting album pages and composing text. Untill I'll have more time the gallery will be in Russian. The three-week-long Vacation has been absolutely unbelievable. "A SONG FOR THE SUN" EP is out now! Hurry to download 40 minutes of an Atmospheric Dark Light Metal! Tomorrow at noon I'm recieving first printed CD's, just one day more to wait! Today a brand new track for the upcoming EP has been recorded. It's 12 minutes and 20 seconds long. I simply feel proud with that! Now, to re-record a few "old" songs. At last! The hosting has been activated, so the 15th of January is the Start Time of Meander website! Hopefully, in a week or two everything will be uploaded, and site will be working properly. The hosting has been payed yesterday, so in a few days the site will be placed out in the web at http://www.meanders.eu. In the beginning of December (goosh! it was previous year! :)) A Tune For The Moon EP has been released. Read about it in Releases, listen in Downloads! By the way, on the 24th of December, 2002, I have created for the first time ever a website. It has been http://innersea.narod.ru (what else?! ), made with a help of Narod schemes and looked awfull:) for the present day I have executed job on 7 (including this) websites. This is my recent music project, that appears to be a stright sequel of the Inner Sea in music ideas and mental conceptions. The main difference is that from now on I am doing it all alone, for as a consequence of betrayment that took place in Inner Sea I have no lust to fall into the same pit twice by recruiting the band. Therefore, there are no concerts, no live shows... But Music.